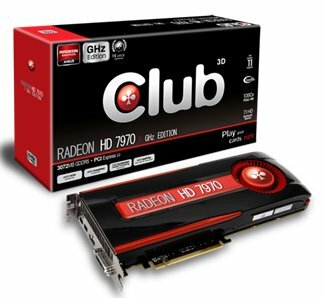 Club3D presents its Radeon HD 7970 GHz Edition card. Following the introduction of our Club 3D Radeon HD 7970, Club 3D today introduces its brandnew Club 3D Radeon HD 7970 GHz Edition. Records are made to be broken, so shatter them with the new and unbelievably fast Club 3D Radeon HD 7970 GHz Edition. In March, Club 3D introduced the Radeon HD 7770 GHz Edition, With a reference engine clock of 1GHz, this represented an engineering milestone for the graphics card industry. With the new Radeon HD 7970 GHz, we are continuing to deliver on this high-performance pedigree. How is the GHz Edition variant of the Radeon HD 7970 different? The Club 3D HD 7970 GHz Edition embodies the maturity of the 28nm process, and the scalability of the Graphics Core Next architecture. Due to both of these factors, the GHz variant raises the GPU core clockspeed from 925MHz to 1000MHz+. This card also features an extension to AMD Powertune technology called "Boost", which allows the GPU to dynamically adjust both voltage and clockspeed above the reference clock of 1GHz+.